PHOTOGRILL: Can you tell us about your photography? PHOTOGRAPHER: From the moment I moved here in 1979, I fell in love with San Francisco. It’s a compact, friendly little city with great diversity. I cannot get enough of it, from the ocean beaches to downtown streets. So when I got my first dSLR three years ago I started shooting cityscapes. And once I learned how to take long exposures at night, my cityscapes morphed into twinkling buildings and bridges surrounded by a sea of blackness. And those in turn morphed into an endless set of streaming light trails as cars and trains skidded past my camera. Okay, maybe there was an occasional surfer, skateboarder, flower, church interior, or table-top setting thrown into the mix. But my heart was into cityscapes – day and night. Recently, however, I’ve been finding cityscapes and light trails less and less satisfying. So what’s next? I think the answer is short exposures – street candids – particularly pictures of people in dark settings, bathed in pools of artificial light. I want to explore the film noir side of the city and tell a moody story. And I want more rain, dammit. This city is too dry for too many months of the year. 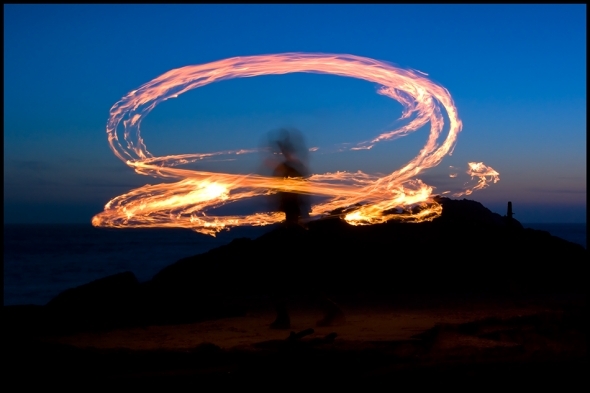 PHOTOGRAPHER: One night, quite by accident in fact, I stumbled into a group of poi-and-fire-baton slingers out by the ocean cliffs. Being not brain dead, it only took a millisecond to decide that fire was more exciting than waves and rocks. I had no idea how to go about shooting fire spinners. And I had never seen anyone photograph fire spinners before. But given fifteen willing subjects and more than a few gallons of gasoline, I figured this had all the ingredients of an exciting photo-shoot. So I started with zero knowledge and took a handful of test shots to get my bearing. PHOTOGRILL: Walk us through your thinking process for this image. PHOTOGRAPHER: I was thinking creatively, I really wanted someone to burst into flames. Giant, beautiful, incendiary flames! In my book, photo-journalism trumps artistic photos, any time, any day. But since that wasn’t going to happen, my next thoughts were about how to frame and expose the picture to get good light trails. I decided to go with the straight-forward approach, framing the entire person and their fire trails. Next time, I’d like to try closer, more intimate shots from different angles. And as for exposure, I knew from shooting car trails that you need just the right amount of trails to make a photograph interesting. Too many and you end up with a glowing mess. I figured two or three revolutions of the baton would work – and five would be too many. The real challenge was keeping everything in the frame. The fire spinners wandered left and right. They swung the baton too high or tossed it up into the air. They moved forward and back, in and out of the focal point. And here I was, with a camera mounted on top of a tripod, relatively immobile, trying to follow the fire-spinners and get them entirely in the shot. I wanted to stay invisible, remain a guest, and not direct the spinners in any way – which only made this a lot harder than it otherwise could have been. Of 100 shots, 25 were tossed out because of framing problems. Another 25 were tossed due to focus problems. And another 25 were tossed because nothing really interesting happened during the 2-3 seconds I had the shutter open. PHOTOGRILL: How did you balance the exposure of the fire against the sky, is it simply right time of day as light is fading or have you finely calculated that? PHOTOGRAPHER: Well given my decision to shoot 2-3 revolutions of the batons over the course of 2 or 3 seconds, the first problem was finding an ISO and aperture that would give enough depth of field while not underexposing the shot. Shooting manually with a wired shutter release, with some trial and error and careful examination of the histogram, I found a sweet spot: ISO 400 and f/8, give or take a little. I adjusted those values up and down a little as the sky darkened. The next problem was one of timing – how could I capture fire trails with enough detail and not end up with a featureless red blur. I quickly learned not to shoot during the first minute or two after the fire was lit – the fire needed time to cool down. Conversely, during the last minute or two of spinning, the fire became too dim to create dramatic photos. Two shots (the one above and this photo on my photosteam at Flickr) turned out particularly well – but based on feedback from others, it seems that most people prefer shots with blue sky as part of the composition. Color matters. In hindsight (yes, there’s always hindsight), I would have loved to experiment with trailing sync flash, especially a flash located to the rear of the subject. I am curious to see what would happen if I froze a fire-spinner’s body a particular moment in time. PHOTOGRAPHER: Not too much. There’s some sharpening and clarity, contrast, some noise reduction, and a little dodging of the ground to brighten the pool of light by the spinner’s feet. PHOTOGRILL: It must be quite a ‘buzz’ to make photos like this (where the final image is not exactly what your eye is seeing), and then see the image in your screen? PHOTOGRAPHER: I’ll say. In fact, after I saw the photos on my PC, I wanted to call up all of the spinners and tell them they were incredible people and my new best friends forever! But a week later, I forgot all about it. That’s what happens when you drink: you forget things quickly. PHOTOGRILL: What interesting general tactics do you use for night photography. What elements of night photography are important, what are not? PHOTOGRAPHER: Funny you should ask. I just finished writing up a series of articles for ‘All City’ about how to shoot at night. – People! There’s nothing better than photographing a person to add to a storyline. PHOTOGRILL: Any funny or interesting anecdotes about your night forays? PHOTOGRAPHER: I’ve learned you should never sneak up behind another photographer when you’re shooting in a cemetery at night. They jump and curse loudly. PHOTOGRILL: Do you enter competitions etc? PHOTOGRAPHER: Competitions? Accolades? No. I’ve seen how other people shoot and I know I’m still climbing the learning curve. If and when I get a masterpiece worthy of recognition, my mother will let me know. But for now, she thinks I should get a real job and stop spending so much time on Flickr and All City. She’s right. PHOTOGRILL: Is there anything I should’ve asked? PHOTOGRAPHER: Yes. And the answer is that the perfect martini needs to be served in a chilled glass. This entry was posted on Monday, May 9th, 2011 at 6:41 pm. It is filed under The Grill and tagged with Creative Photography, Photographic Techniques. You can follow any responses to this entry through the RSS 2.0 feed. Every 2nd Thursday of the month (8-10pm), there is a Fire Jam at the plaza in front of the Ferry Building. Great opportunity for more fire poi photography. We usually get a decent-sized group of photographers and spinners. 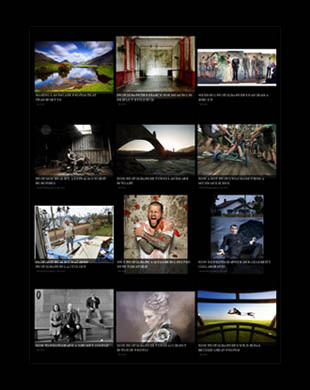 It’s an honor to be featured on Photogrill, Craig! Thank you. 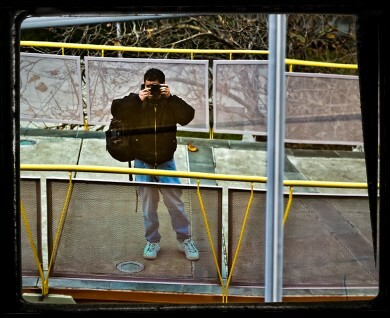 I hope your readers also get to check out the amazing work from my fellow brotographers on AllCitySF.com. They continue to blow me away every day. It’s a pleasure to have you here Bob, keep up the good work. I have to agree the you have a great community around photography at AllCity, check out everyone!